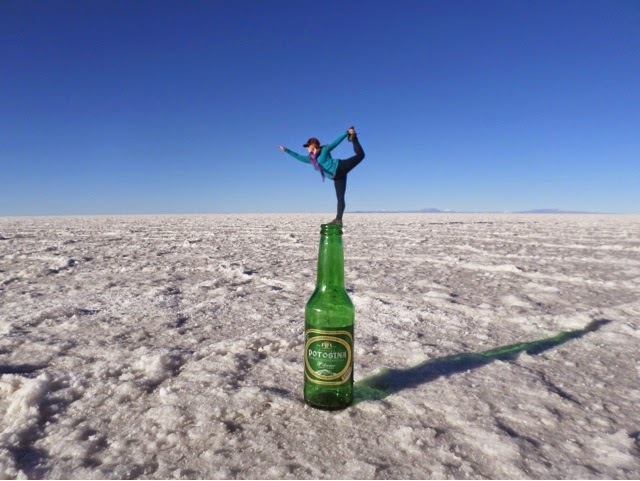 The first night of my adventure into the Bolivian salt flats was spent in the closest town, Uyuni. 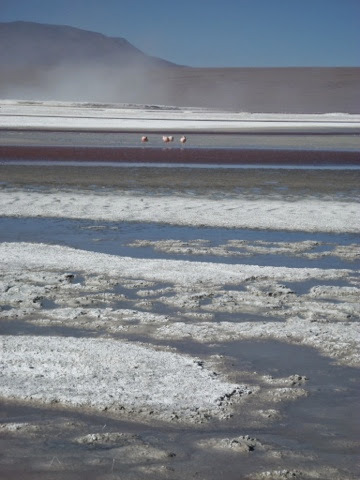 The salt flats are actually called Uyuni de Salta. The town has a very western/Australian outback feel to it, with dusty streets, lots of 4WDs and everything is a bit run down. We stayed just for the evening and didn’t do much other than to get US Dollars, as the exchange rate is better here and it’s hard to get them once I’m Argentina and also to have dinner. I also bought socks woohoo! Exciting for me as I had stupidly only packed three pairs of socks, despite knowing I was travelling in autumn and would be doing lots of shoe requiring activities! Oh well, I just hate wearing socks usually so I messed up on that one! Also the hotel in La Paz lost one of my socks in the laundry so I was desperately down to only two pairs, oh the horror! But it’s OK, relax, my feet are now happily ensconced in new socky goodness! After a mediocre dinner I headed off to bed, super excited about the adventure to come! The trip started out well with a good breakfast, hurrah! There were actually eggs! The routine of tooth breakingly bad stale bread and strawberry jam is just getting a bit unbearable now. Our group’s vehicles arrived and we loaded up the roof racks. 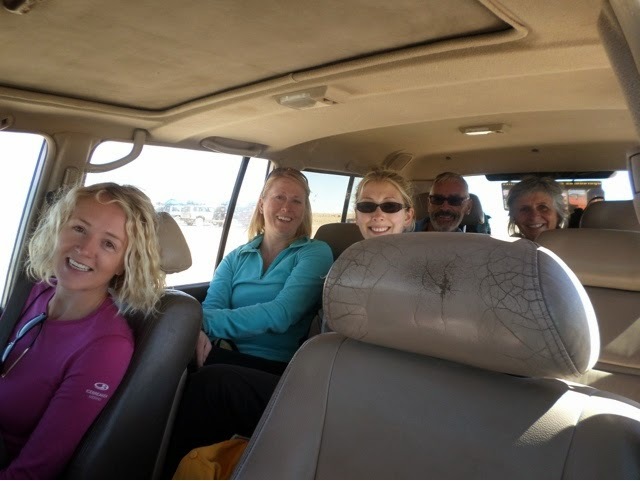 We have two land cruisers, with six passengers in each. There is a black one and a silver one, I’m in the silver one with our driver Javier, Courtney, Michelle, Ruth and Gerry… So Gerry has a car full of woman, such a hardship. Bizarrely another random girl has been out in the other car as her group from the day before supposedly left without her. 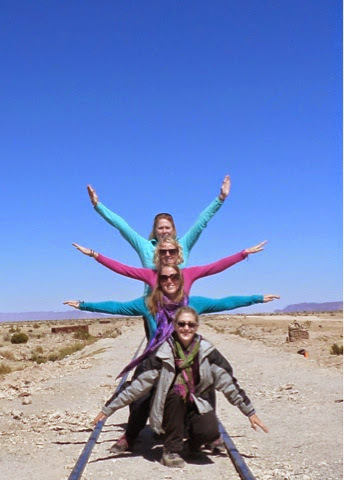 She’s a nurse from Perth who has been travelling around for over a year and is heading to Dubai for work next…. She’s very odd and told us all that she didn’t like people from tour groups… So we got off on a good foot. We then headed out… Exciting! The first stop was just outside the town. 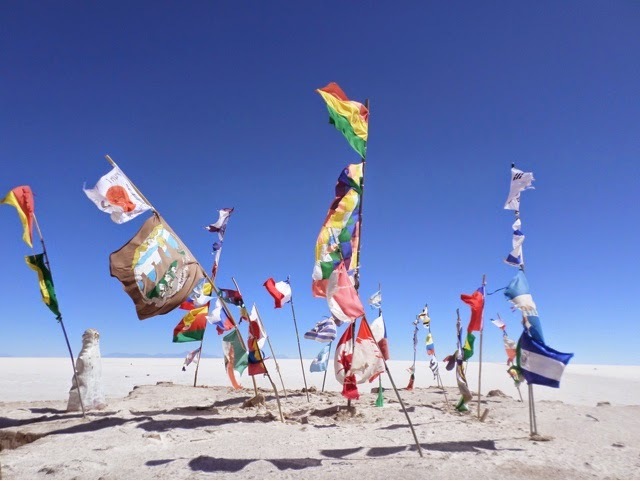 Uyuni used to be an important town in relation to Tin mining. 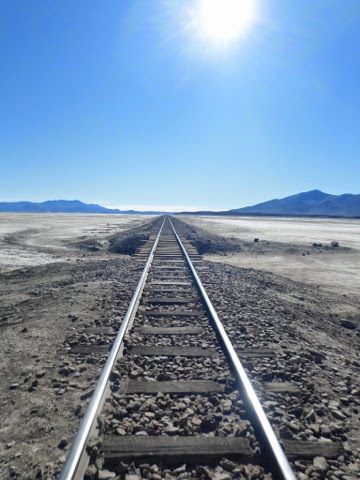 The train line that was used to transport Tin between Bolivia and Chile and terminated here. Nowadays the train line still runs but not very frequently, although people did hear a loud train in the middle of the night. The old trains which were out of service were simply pushed off the end of the line and left to rust in the desert. You can now visit them and they are pretty interesting. They are just out in the open and as a result people climb all over them and they are pretty covered in graffiti. Some of them have been altered and have swings on them too. We had fun climbing in, out and over the trains and posing for lots of fun photos. 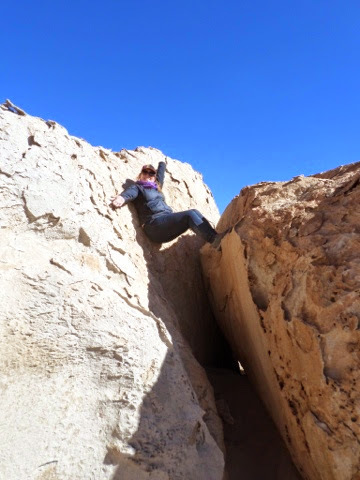 Climbing on top of them gives you a great view across to the desert too. It’s a bit sad seeing all these amazing looking old trains left to rust in a giant train graveyard instead of being recycled. However it was a pretty fun place to visit and a good start to the morning. When you look out along the train line the land is so flat is seems to just disappear into nothing. We were quite lucky as our driver is very experiences and obviously very organised and proactive so we were one of the first cars there. 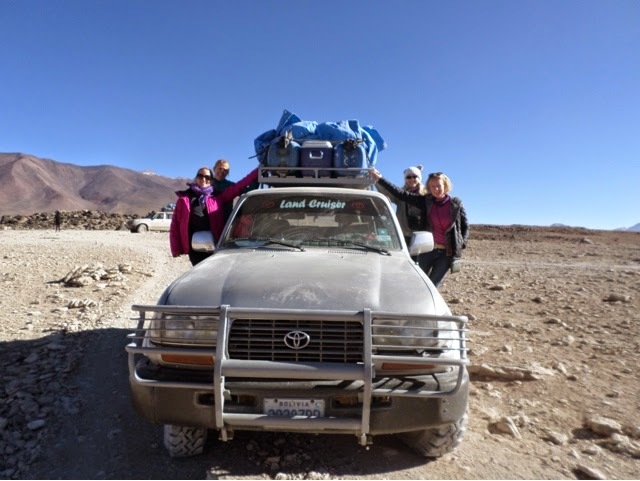 By the time we left it was crawling… We are definitely on the gringo trail here…. It’s good to know they we were positioned ahead of the pack though so we wouldn’t have a too busy tourist filled experience as we have generally been quite lucky at avoiding that so far. The cars then headed out into the desert. The elevation is around 3600m and you enter at point called Centro Artesano, where funnily, given the name, there are markets. 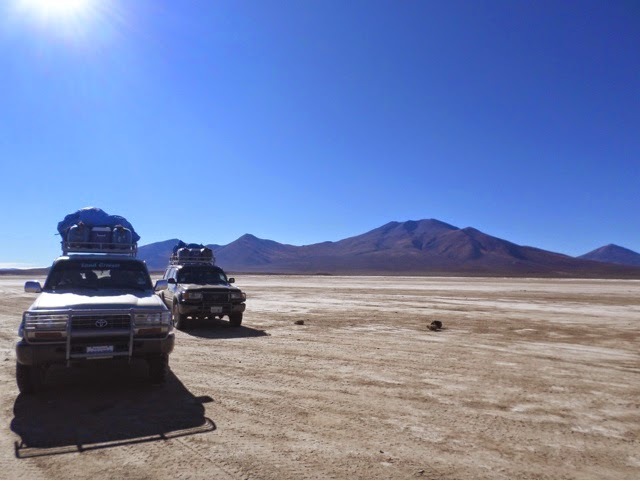 We then followed the proposed Dakar 2014 route via Ojos del Salar. However this year the ground was too wet and therefore the vehicles didn’t take the intended route and in fact had to skirt the lake. The flats are like a great ocean, the white of the salt almost reflects the sky and does look like water, it almost shimmers. The mountains in the distance seemingly hover in the air like floating islands and the other cars driving in the distance look almost like large hovering ducks. It’s a very beautiful place and you feel like you could just sit and stare out across the landscape forever. 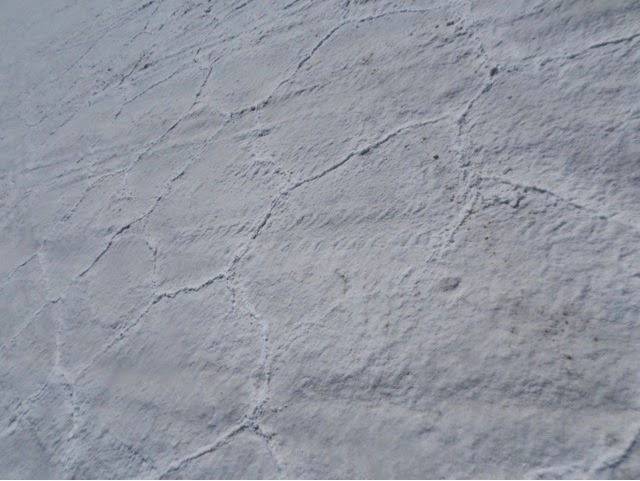 The surface is covered in honeycomb patterned desiccation cracks and it’s quite pretty looking. From there we drove further into the flat. 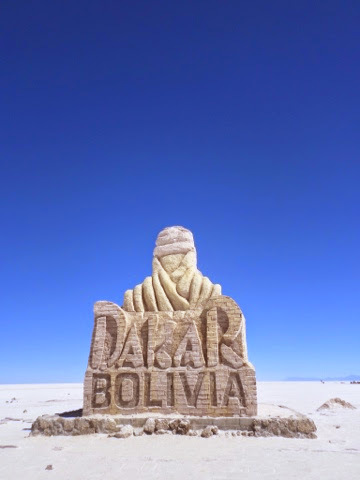 There is a large Dakar statue which was a checkpoint for the route, from here we walked over to a place named Hoteles se Sal, the salt hotel. Although, this is essentially just an empty brick building. Next to it are lots of flags, from the countries of the rally. They look really nice fluttering in the wind and lots of people were posing with their home flag… There was no British one, only an Aussie one. Funnily someone had written in Spanish on the Aussie flag about the British and the Falkland Islands…. On the wrong flag…. Miraculously timed photo given the number of people who kept jumping in front of the statue! Pretty flags, but no British one. 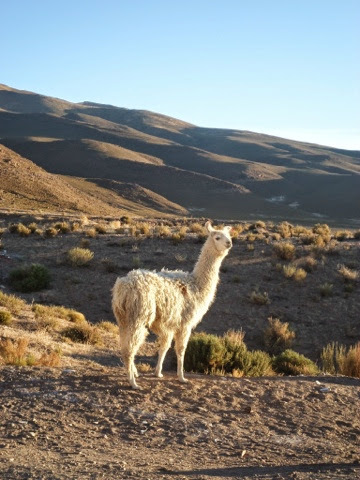 The two cars re-joined and we ate lunch as a group, llama streaks and quinoa. From the lunch stop we had a walk across the salt to an area where the groundwater is very close to the surface and gas is bubbling up from the ground, a bit like a spring, but still under the salt. 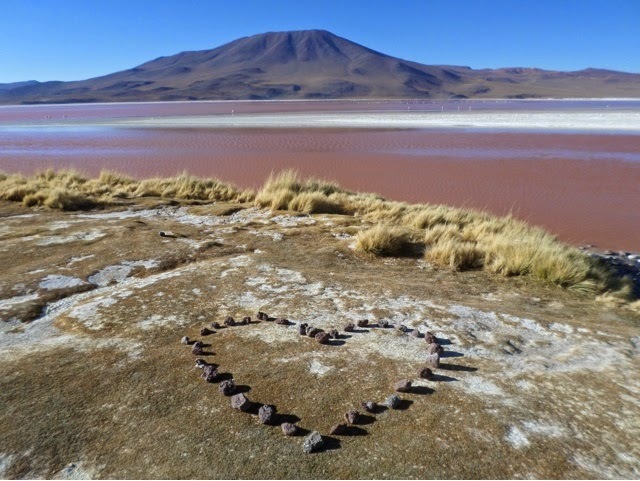 The area is currently mined for Lithium, which we all depend on for batteries. Scientists have also discovered that bacteria present in the waters here may have the capability to biodegrade plastics. If this is true it would be an amazing discovery! After fooling around taking pictures we jumped back into our cars and headed out again. 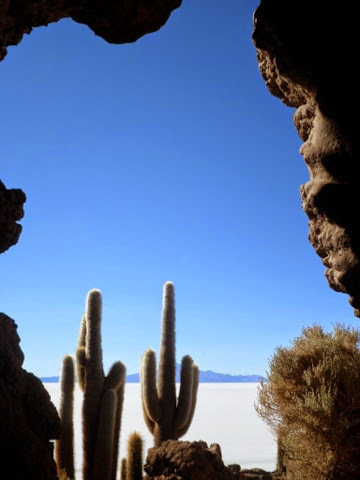 There are several small ‘islands’ in the dessert and we’drove across to Isla Inkawasi (Isla Pescador), which is commonly called fish island or the island of giant cacti. The island actually consists of coral, in fact the bottom few metres are made up of stromatolites which are then covered by other types of corals. Stromalites are one of the earliest known forms of life and are extremely important in the geological record. They Mark the start of the evolution of complex multicellular organisms. They are also in fact still present in a single area off the coast of Eastern Australia. They are essentially algal mats which grow up in domed structures. You could see the dome shapes on the island and where these had been eroded or broken apart you could also see the concentric growth patterns. The other coral species overlying the stromatolites are the more common looking coral types you see about today. They are quite rough to clamber over though as all the little spiracles from the polyps break cause it to break apart with sharp edges. The island is home to the most enormous cacti. Some of them looked to be about 5-6m tall. They only grow at a rate of approximately 1cm per year which makes the larger ones very, very old! There is a small track which takes you up to the top of the island, from where there are the most amazing 360 degree views out across the flats to the mountains which surround the area and bound the former lake. 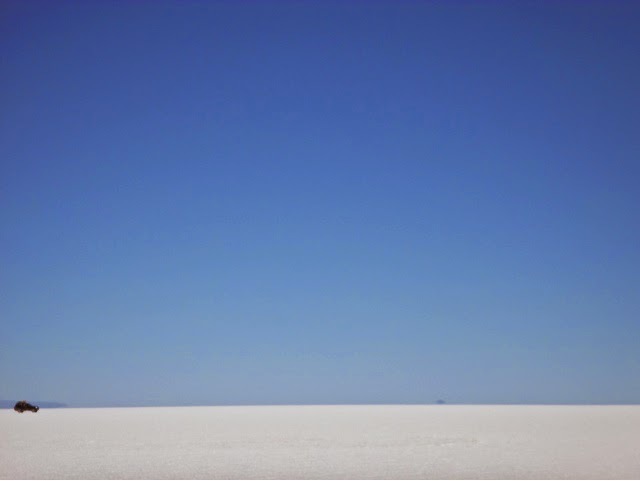 The sky was just the most amazing deep blue and the salt was blindingly white, it’s just completely stunning. On top of the Island, looking out across the salt to the mountains you feel like it is still a lake. The rest of the afternoon was spent posing for photos out on the flats. The salt allows you to take pictures which play on the lack of perspective… We had all packed a few props to play around with. It is actually pretty hard work though and you have to be prepared to spend a lot of time on your belly waggling your camera around. On the drive to our hostel for the night we left the flats and actually drove last quite a lot of farms. It was amazing to see fields along the edges of the flats as it seems incredible that anything would grow here. The farmers grow quinoa and black quinoa in this area, but I can’t imagine that it can be an easy place to live. Funnily as we were driving along Michelle thought she spotted a prison, it certainly looked like one with lots of barbed wire, high fences and a small watch tower…. Then we started driving towards it…. So we wondered if it was actually where we were staying as we had been warned it was extremely basic. Everyone was relieved when we drove past it, until we saw where we were actually headed. It looked completely run down or only half built, so everyone was dreading the overnight. However hilariously, it was actually extremely nice inside. I’m. It sure you’d actually believe that they were the same place if I showed you pictures. The hostel is in an area called Colcha, just north of San Juan on the edge of the flats, there is actually nothing there apart from the hostel building and the weird empty prison looking building. The building is actually made of salt, everything including the dining tables and the beds are actually made of salt. After dinner we headed off for a cold night in our dorms, we had a girls dorm and a boys dorms, so it felt a bit like a school trip. The stars are just unbelievably beautiful here and you can see the Milky Way really clearly, although it is pretty cold so it’s hard to stay out for a long time. I also saw lots of small fires burning in the fields, I’m guessing for famers or to do with the harvest of the quinoa, which they were just finishing. Over breakfast on we were entertained by a small llama and his two dog friends playing around the hostel, I think they live there. Unfortunately there was also no water as the pipes had frozen and we also drove over a frozen stream! The resident llama 🙂 he actually chased me round the car! 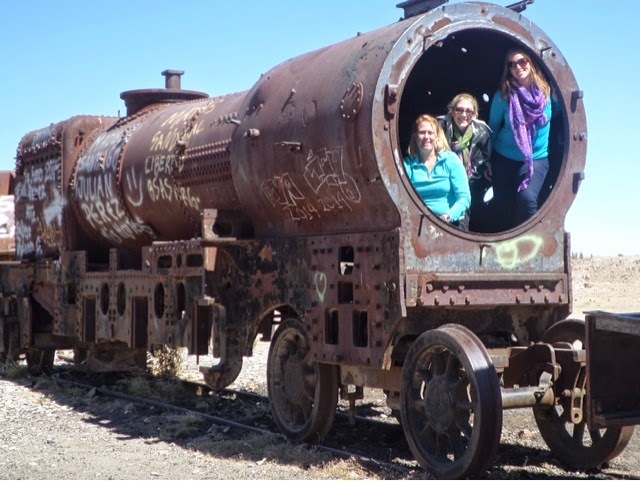 After driving through another tiny town we headed out across train tracks, which seemly connect nowhere to nowhere…. 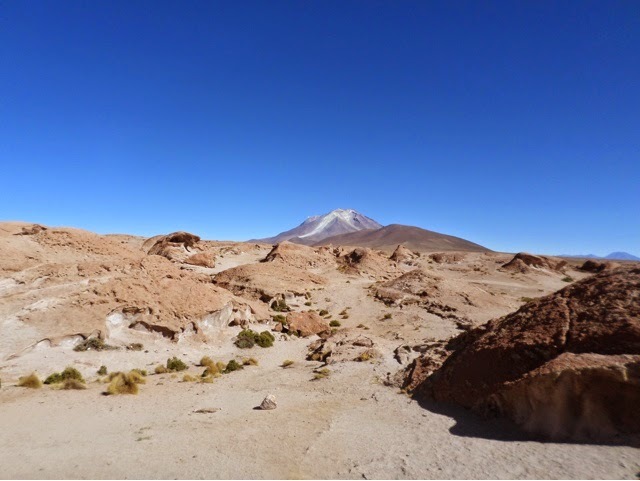 The first stop of the day was at Ollague, where you have views of volcanoes all around you, in fact some are located partly in Bolivia and Chile. The lava flows which fill the valleys between the volcanoes have eroded in pretty funky ways and we had fun scrambling over them and generally posing for lots more photos. 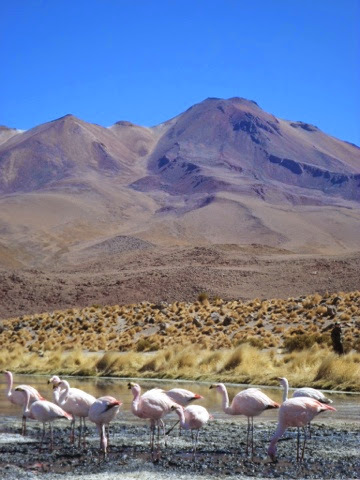 The next stop was the national park, Eduardo Avaroa and Lake Cañapo. Lunch was served at the edge of a lake, watching flamingos. They’re pretty cool birds and you could get fairly close to the. As it was pretty quiet when we arrived. They’re birds and they’re pink, what’s not to love. 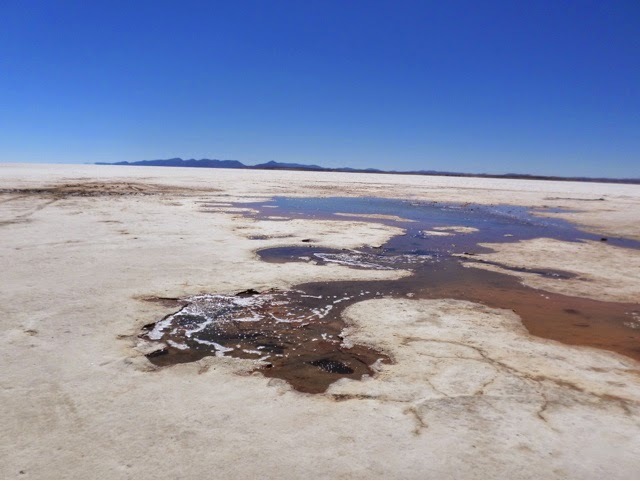 We drove past three more lakes, all beautiful and edged with thick salt. The route then headed back out across desert, we got to see lots of wildlife, a fox, tonnes of vicunas and also viscachas. 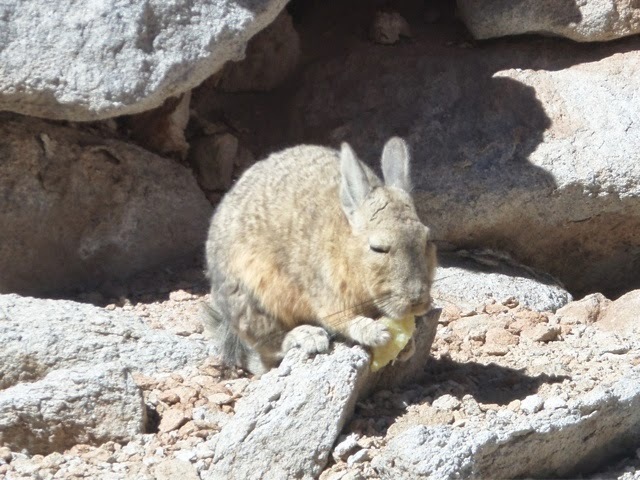 Vizcachas look like a cross between a bunny and chinchilla, they are very cute! Our driver stopped to feed them apples. We were driving along a river bed, which steep rocky sides, like a tiny canyon and we spotted loads of them hiding on the rocks enjoying the sunshine. We stopped to point the. Out to the other group behind us, or at least we though so… It turned out our other car had a break down and we were actually showing a bunch of random people all the things we spotted… Nice for them sad for out other group though? The road disappeared and our group headed out seemingly into nowhere. Our driver was awesome and took us the long way around and we just had the most insane views of gorgeous multi-coloured mountains all around us. 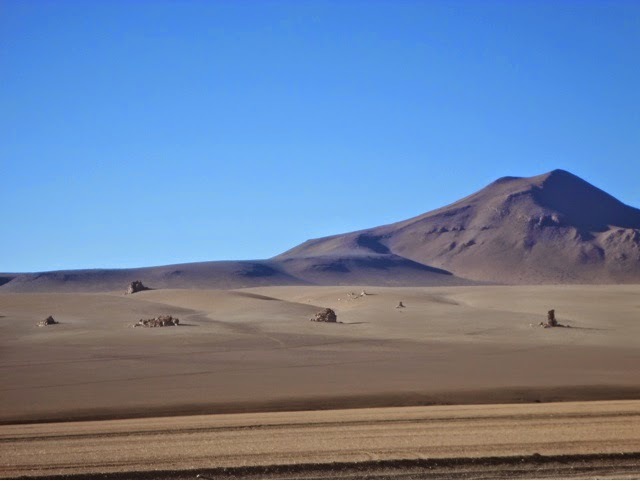 We passed our high point for the day at around 5000m and we stopped for an extremely cold windy photo of the hills, which almost look as though they have been painted. 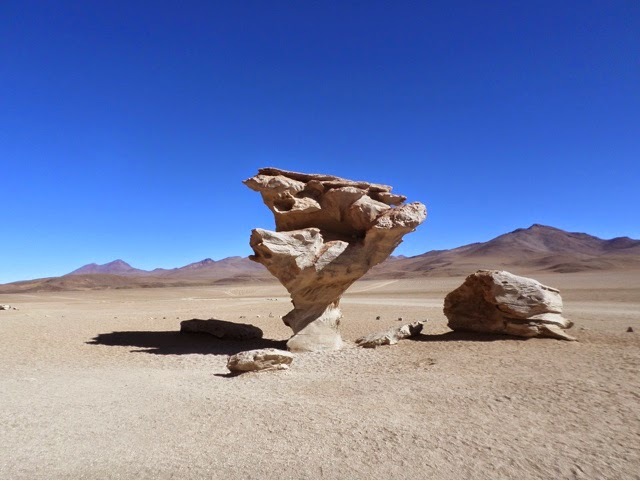 From there we drove down to the famous Arbol de Piedra, which is down at 4590m. It’s pretty incredible looking and the pictures really don’t do it justice, like everything else here! We explored the other rocks and did a bit of clambering around 🙂 Despite being really sunny it was soooooooo cold. 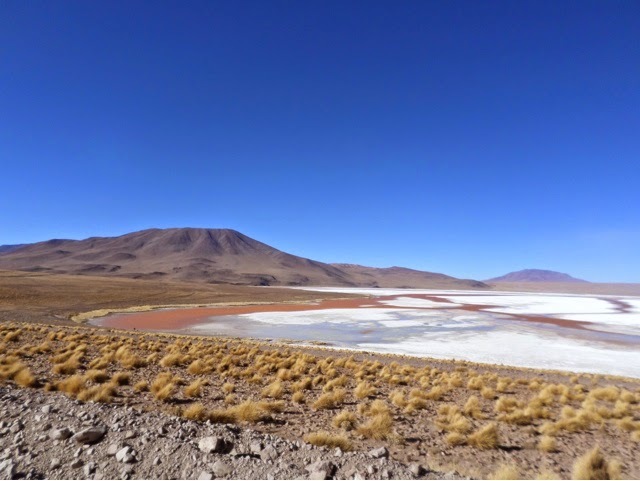 It was the on to the last stop of the day the red lagoon, Laguna Colorado, which is even lower at 4277m. 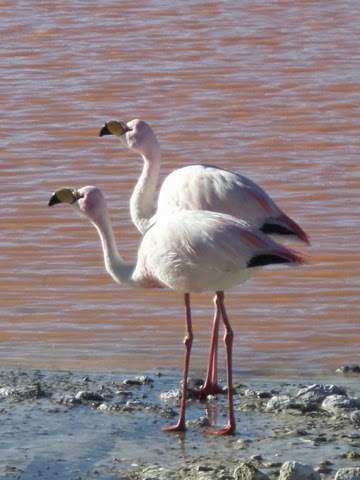 Flamingo couple out on a hot date. The lake is beautiful the red of the water, the white and yellow of the plants and salt that fringe it and then the deep blue of the sky are just gorgeous. The red of the lake is due to algae in the water. That might we stayed in a other small hostel, this time built from concrete. It was so cold it was ridiculous! 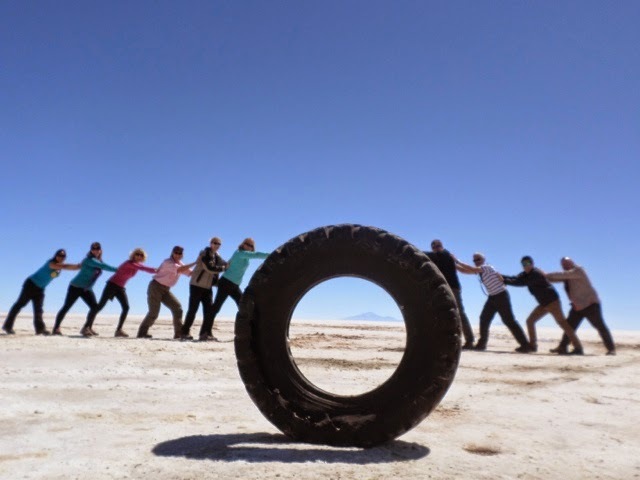 The final day of our little trip and sadly also our final day in Bolivia started super early, at 4:30am. 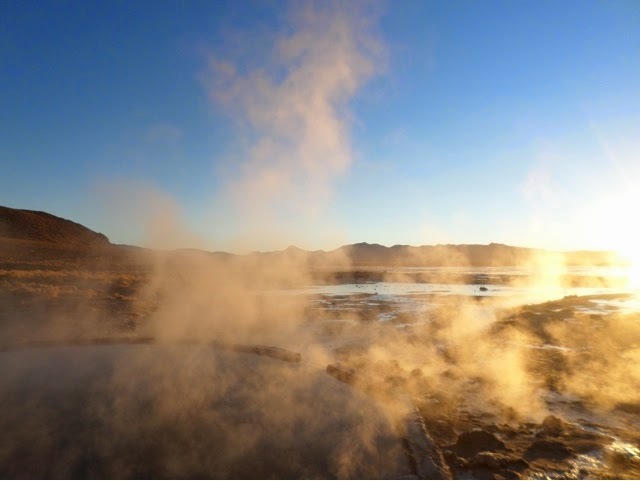 We drove up to approximately 5300m and watched geysers with the sun coming up behind the surrounding volcanoes. It was breath-catchingly cold. It had gone down to almost minute ten degrees overnight so that early it was most definitely still below freezing. Breakfast was eaten looking out across natural hot springs at Polkes. Some people went for a bath in a thermal pool whilst others got stuck into the pancakes! Oh yes there were pancakes! 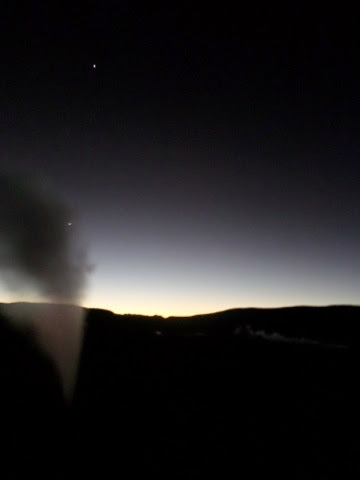 The breakfast view of the final stages of the sunrise over the hot springs was amazing. The next few hours were spent driving across the desert to get to the border. 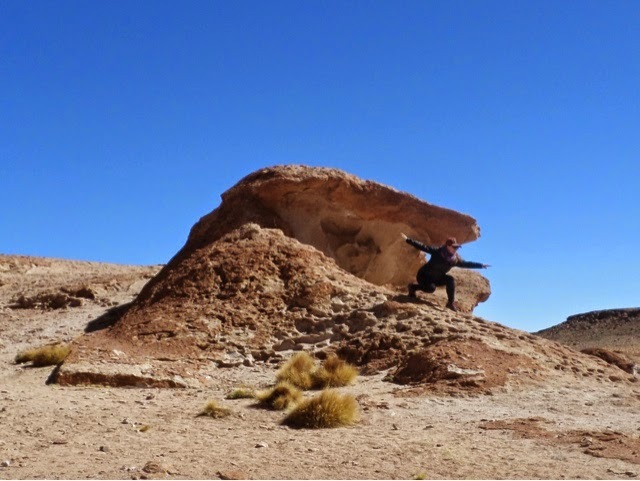 We crossed the Desierto de Dali, so named as it looks very similar to the landscapes which Salvador Dali painted, although he never visited Bolivia. The landscape is pretty odd looking with random blocky rocks sticking up out the sand. 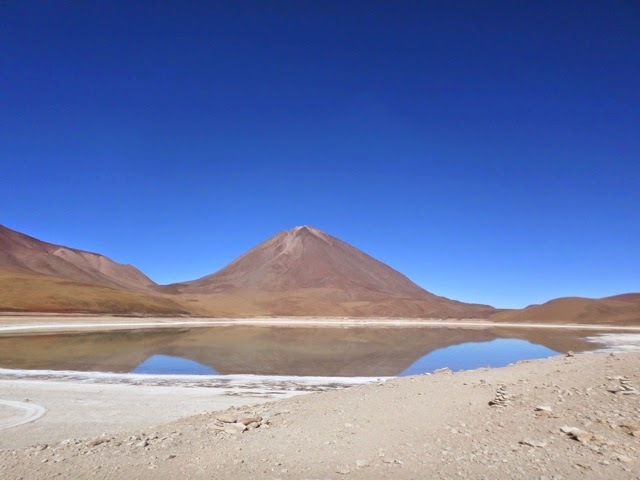 Our final stop was at the green lake, the Laguna Verde, at 4400m. Although it wasn’t very green looking as it had been windy and the algae had been disturbed. Beautiful lake and volcanoes views, you can’t ask for much more. The crew, cold and a bit less clean, but loving it. After that it was time to head to the border. We crossed more frozen streams and desert until we arrived at a set of small huts in the middle of nowhere. After getting stamped of Bolivia it was time to say goodbye to our driver and Freddie our Bolivian guide. We them hopped on another bus and headed into country number four, Chile! The salt flats were a definite highlight, I loved every minute of it. The landscapes just change so much from hour to hour and are just so interesting and beautiful. It was also great to come somewhere that was so different from the places we had come from. From the highlands of Peru to here there is such a difference, but I think this is good or else you wouldn’t appreciate the beauty of your location in the way it deserves. 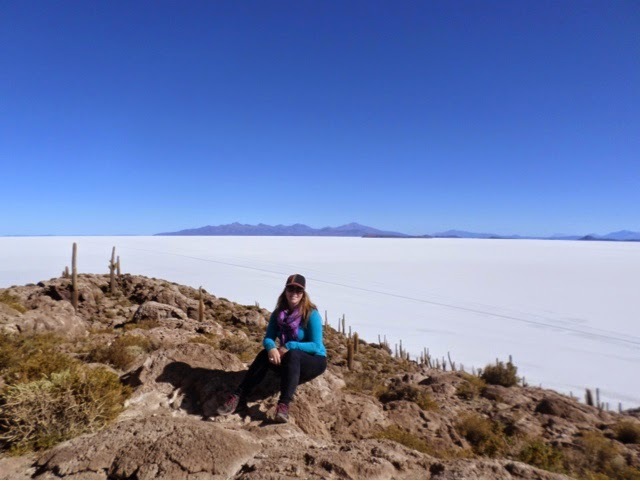 This entry was posted in Travel and tagged 4WD, Arbol de Piedra, Bolivia, Border Crossing, Cacti, Camping, Chile, Colcha, Dakar, Desert, Desierto de Dali, Eduardo Avaroa, Flamingo, Intrepid, Isla Inkawasi, Isla Pescador, Laguna Colorado, Laguna Verde, Lake Canapo, Lithium, Llamas, Ollague, Playa de Uyuni, Polkes, Salt Flats, Salt Hotel, San Juan, South America, SouthAmericanAdventure, Tin, Train Graveyard, Travel, Vicuna, Viscacha. Bookmark the permalink.